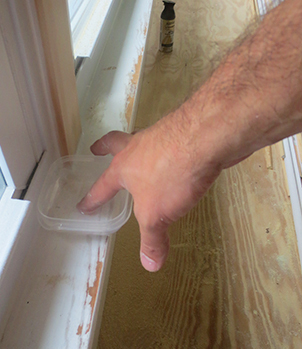 After hosting family over the long weekend, Mark was back at it last week sanding and installing baseboard. First he sanded each of the ceiling beams. It took him three hours. I honestly have no idea how he sanded (over his head, mind you) for three hours, he’s my hero. At this point, we’re just about done sanding, we’ve hit all the trim, the beams, and even some spots on the ceiling that we missed the first time. We’ll do one last look-over before we start to prime for anything we’ve missed, but we’re getting close to being done with the sanding of the walls and ceiling. Of course, we still have to sand the floor, but that’s another issue for another day. 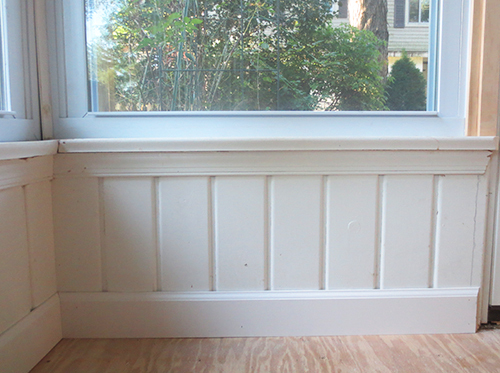 Let’s move on to baseboard, shall we? 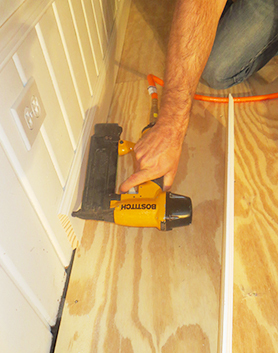 We are using 4 1/4″ baseboard from Home Depot. It’s already primed so we can just paint it when we get to that step. 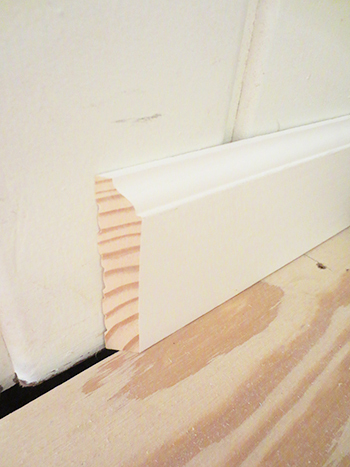 Since the room is longer than any one piece of baseboard, the best thing to do is to cut the end of the boards at a 45 degree angle so that they can be joined together with a flush seam. This technique also works for the corner as well. Once the board is in place, Mark simply nailed it to the bead board using brad nails and his nail gun. But the bead board is only on two of the walls, the other two walls are brick. 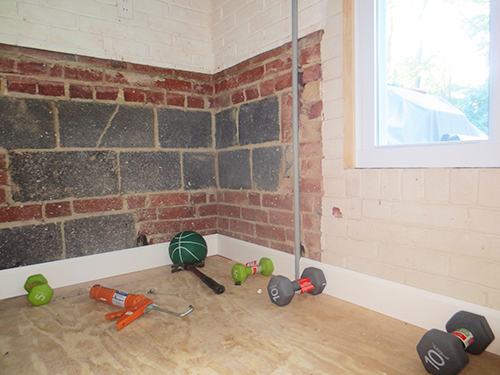 So on these walls, Mark glued the board to the brick using liquid nails and then used some rarely never used hand weights to apply pressure to the boards while they were drying. 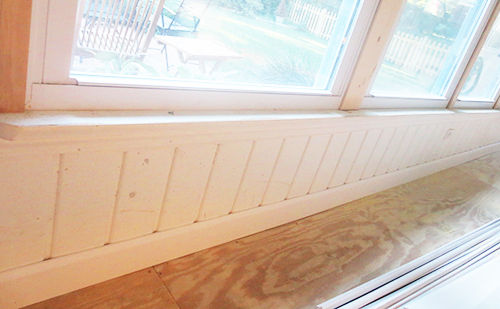 Here’s what the window wall looks like with the baseboard. 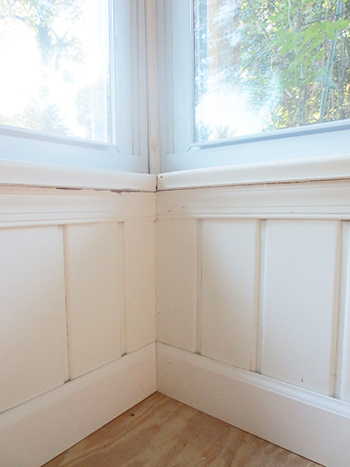 After all the baseboard had been nail/glued down, it was time to caulk. 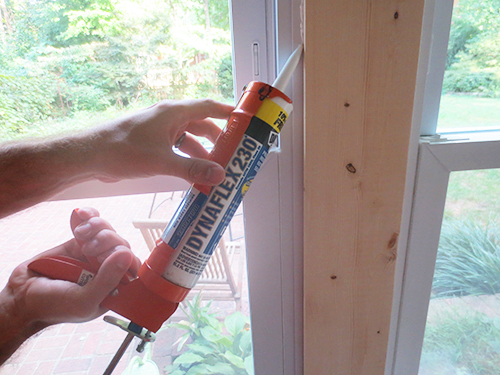 Mark caulked around each piece of window trim, using this kind of caulk. 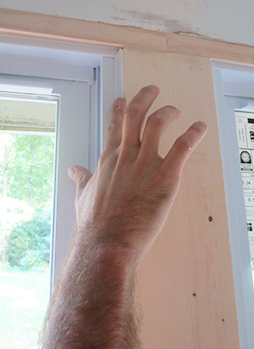 The key to this job is a steady stream of sealant and keeping the tip up against the corner of the trim so that you get a nice, neat line. Once the line has been drawn, you dip your finger in a little bit of water…. 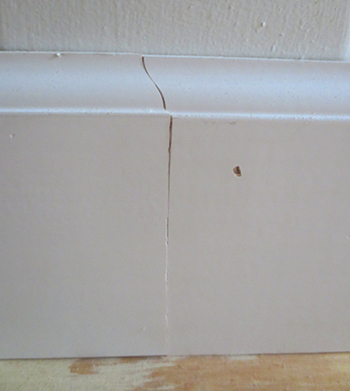 And then drag your finger along the line of caulk to flatten and smooth it out. Repeat this process with every seam to ensure a water tight room. So that’s where we are with the sun room. We’re pretty much ready for paint, but we’re at a halt again with more family in town the rest of this week.